Lymphoma is a cancer of the lymphatic system, which includes the lymph nodes, spleen, thymus, and bone marrow. There are two major types of lymphoma: Hodgkin’s lymphoma, also known as Hodgkin’s disease (HD) and non-Hodgkin’s lymphoma (NHL). According to the Lymphoma Research Foundation, more than 100,000 people are diagnosed with lymphoma each year and there are nearly one million in the U.S. living with, or in remission from, lymphoma. What is molecular imaging and how does it help people with lymphoma? What molecular imaging technologies are used for lymphoma? 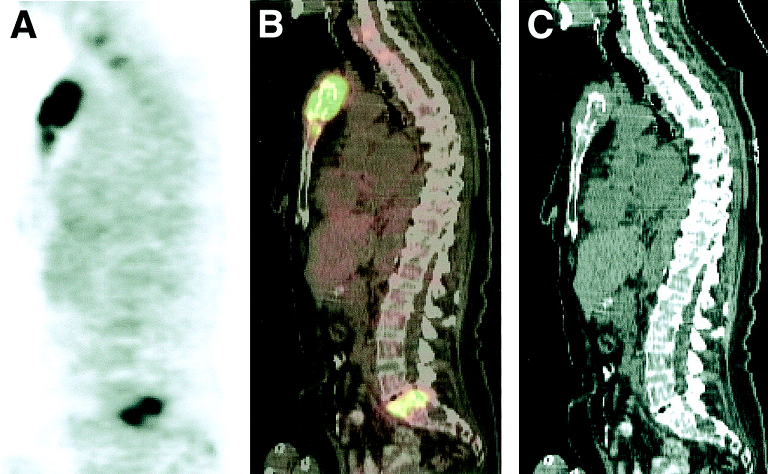 The most commonly used molecular imaging technique for diagnosing and treating lymphoma is positron emission tomography (PET) scanning and PET in conjunction with computer-aided tomography (CT) scanning (PET-CT). Non-Hodgkin’s lymphoma patients who do not respond to chemotherapy may undergo radioimmunotherapy (RIT). What are the advantages of PET for people with lymphoma? are recommended for the diagnosis, treatment and restaging for most types of lymphoma by cancer experts, including the National Comprehensive Cancer Network. provide the most accurate means of monitoring lymphoma patients. Using PET-CT scans, physicians are able to determine the difference between scar tissue and active disease and discover new tumors before they would be revealed by CT alone. 18F-FDG PET scan of a patient with diffuse large B-cell lymphoma. (A) PET scan (B) CT scan (C) PET/CT scan. PET-CT studies to diagnose and evaluate the effectiveness of treatment for lymphoma are covered by Medicare and Medicaid. Major insurance companies and health maintenance organizations also provide coverage for PET-CT studies for lymphoma. Check with your insurance company for specific information on your plan. What is the future of molecular imaging and lymphoma?